Hi, I am interested in your 1985 Chevrolet Corvette Coupe (stock #1146-NSH) listed on Autotrader for $11,995. I'd like to get more information about this vehicle and confirm its availability. 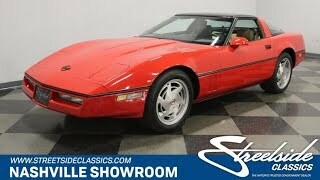 This car is a great example of the C4 Corvettes which were groundbreaking in so many ways. It was a clean break from the C3 which was designed by the legendary Zora Arkus Duntov. Dave McLellan was now in charge and gave the car a completely new chassis as well as a new look. The emphasis was focused more on handling and braking, and they scored big on those counts. But they didnt disappoint with the styling either. Check it out. The shiny Red paint on this car really works well with the fluid lines of the body. Thanks to those hideaway headlights, the hood of the car slopes down dramatically to the front bumper which then slopes down even further, reaching out and down for the ground. There is a power bulge in the hood and vents in the front fender let hot air flow out after being scooped up at the front to keep everything cool under the hood. A black line of body molding runs down the entire length of the car. The windshield is raked back at a serious angle and the hatch glass blends smoothly into the short rear deck and back bumper. At the back of the car, it keeps the classic four round taillights that the Corvette has made a trademark look and there are quad exhaust tips peeking out from underneath. Turbine wheels with a racing flag and bowtie center complete the clean look of the car. Open the door and you will find an interior full of modern comfort and convenience items as well as offering the support and control that you will need if you decide to see how far the emphasis on handling and braking has taken this car. The door panel has a long armrest for comfortable cruising and the power window and lock switches at your fingertips. Step over the deep door sill that is a characteristic of the new chassis design, and settle into the comfortable and supportive leather seat. Reach out for the steering wheel and check out the liquid crystal digital dash behind it. The speedo and the tach cut graceful arcs as they wind up and readouts for other engine functions as well as the trip odometer are clearly visible directly in front of the driver between them. Cargo space and accesability were finally designed into this model making it much more user friendly for traveling or daily driving. Tilt that hood forward and you will find a tried and true Chevy 350 nestled down in an all original engine bay with signs of good regular maintenance. A multiport intake manifold sits proudly on top gathering up cold air from the very front of the car. Power flows back through a 4-speed automatic transmission to the rear wheels, and here is where the cars design focus starts shining through. The rear suspension has been independent with a transverse leaf spring for a while, but it was retuned and there is a completely redesigned front suspension which incorporates a new carbon fiber transverse leaf spring. That dramatically reduced unsprung weight while acting like an anti-roll bar at the same time. All new brakes with aluminum calipers provide even better fade free braking than before and the new frame design which is more rigid and lighter than the old one provides a stable platform for all the new suspension and brakes to get their job done. The rubber meets the road through 255/50ZR17s in the front and 275/45ZR17s in the back. New designer, new chassis, new look, new performance capabilities. It just needs a new owner. Might that be you.